Take Exit 43A, bear to the right, go over the overpass and go north on Carleton Ave, following the signs to the Cohalan Court Complex. The entrance to the court complex will be on your right. Take Exit 43A. At the end of the ramp proceed straight through the traffic-light-controlled intersection, pass the Federal Courthouse on the left and turn left at the first intersection. Take Exit 56 (State Route 111). Go South on 111, and bear left at the fork to Wheeler Road. Wheeler Road becomes Carleton Avenue when you cross the railroad tracks. Continue south for a total of about 3.5 miles. The Court Complex will be on your left. Follow the signs to Cohalan Court Complex. 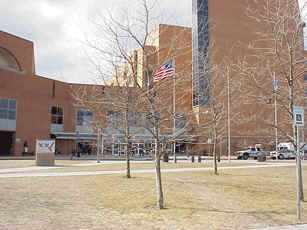 The entrance to the District Court Building is across from the flag poles in the main parking lot. The arraignment courtroom, for all new arrests, is in room D-11 on the first (ground) floor. The Clerks' Offices are located on the 2nd floor. The trial parts are located on the 3rd, 4th, 5th, and 6th floors. The courtroom number will tell you what floor it is on, for example D-31 is located on the 3rd floor, while Courtroom D-65 is located on the 6th floor.